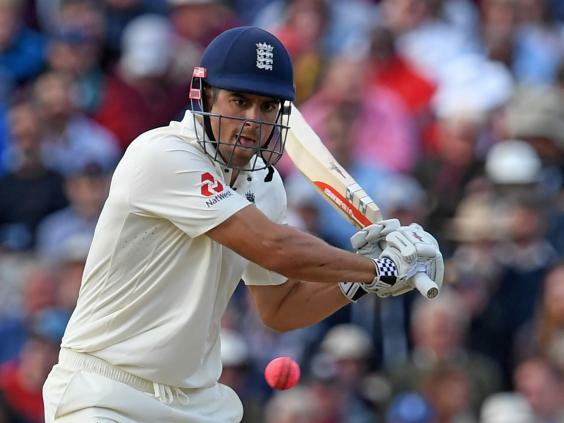 Alastair Cook cashed in against a beleaguered West Indies attack to register his fourth Test double hundred before Englandâs attempts to hammer home their dominance in this opening match of the series were thwarted by the Birmingham rain. Cook spent nine hours and 22 minutes at the crease in compiling a stubborn 243, spanning 406 balls, before his dismissal during the second session on day two here sparked Englandâs first-innings declaration on 514 for eight. West Indies, batting under floodlights from the start of their reply thanks to the dark skies above, battled through 16 overs to reach 44 for one by the time play for the day was prematurely halted at 7.30pm. The tourists are still 470 runs behind in this first day-night Test in the UK and face a battle to avoid the follow-on, with their target of 315 a tough ask against an England attac k who are making the pink ball talk. Indeed, the result already feels like it is a foregone conclusion given the dominance so far of Joe Rootâs team. 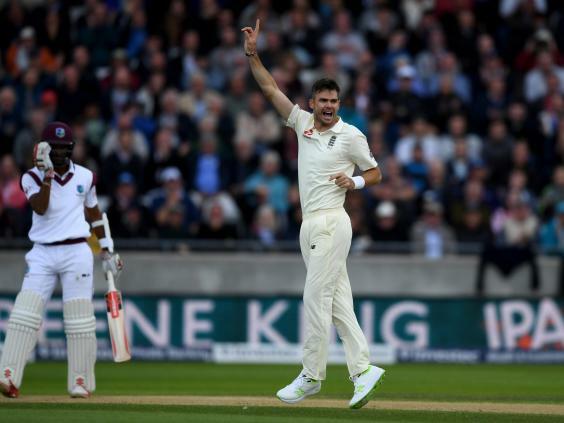 A soporific opening session during which England added 101 runs to their overnight score of 348 for three without barely breaking sweat was at least punctuated by two landmark moments. Firstly, Dawid Malan, whose average was standing at 8.75 after his first two Tests against South Africa, scored his first half-century at this level. Caressing Miguel Cummins down to third man for two in the 18th over of the day, Malan got there in 112 balls. 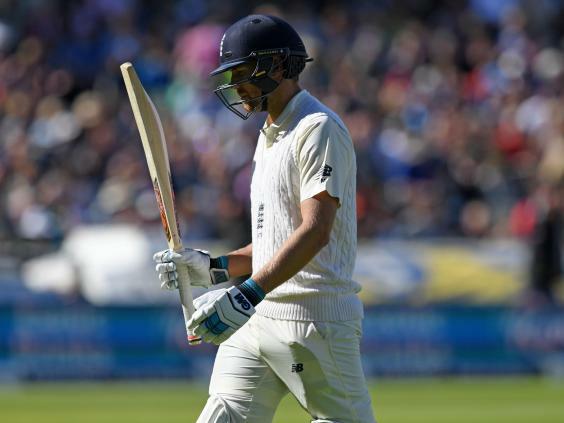 Cook then reaped the rewards for the cussed determination he had shown during nearly eight hours at the crease by bringing up his fourth double hundred in Tests. The fa ct it came from a West Indies misfiled on the third-man boundary summed up the touristsâ ineptitude. Coming in 339 balls, this was Cookâs fastest 200 for England. Thatâs no surprise given the paucity of this visiting attack. However, it means Wally Hammond, with seven, is now the only Englishman with more Test double hundreds than Cook. It was all too easy for the hosts and then the tourists at least made a breakthrough before lunch, Malan throwing away a golden opportunity to reach a maiden Test century when Roston Chaseâs spin had him caught at slip on 65. The Middlesex batsman had thrown away a golden chance to reach three figures for the first time in Tests and potentially book his place on the plane for this winterâs Ashes tour of Australia. Yet however disappointed he will be, Malan knows there are likely to be plenty of more opportunities to reach the landmark against this attack during the remainder of this three-match series. < p>Malan had looked in complete control before his dismissal, that sent England into lunch on 449 for four, and produced one gorgeous cover drive â" against Alzarri Joseph to move onto 48 â" that was the shot of the opening session. Cook, whose stand with Malan was worth 162, was still there at lunch on 213. But he lost new partner Ben Stokes early in the second session when Englandâs vice-captain, looking to move things along, was caught reverse sweeping to Chase on 10. At 466 for five, England were hardly in dire straits. Indeed, the game was drifting at this point, with everyone other than perhaps Cook, whose top-edge offered a chance to West Indies captain Jason Holder on 230, eagerly anticipating the declaration that would allow Root to unleash his bowling att ack. So, it was no surprise when Jonny Bairstow, bowled by Holder, and Moeen Ali, holing out to Chase, both fell within 13 balls, England now 506 for seven. The declaration came soon after, with the hosts on 513 for eight, after Cook eventually fell lbw to Chase for 243 after a successful West Indies review. That gave England just under 40 minutes to bowl at their opponents before the tea interval. They did not need long to make the breakthrough, Anderson striking in the 14th ball of the innings to remove Kraigg Brathwaite with a delivery the opener could only edge behind. West Indies had not even registered a run by then. They at least battled through to tea without further loss â" but not before debutant Kyle Hope had a hu ge lbw appeal from Anderson turned down first ball and Kieran Powell was dropped on two by Stokes at gully off the bowling of Broad. Hope, on 14, also received a life after the interval, Broad again the unlucky bowler as Moeen put a chance down at third slip. The rain, though, then offered the West Indies some much-needed respite just when the pink ball and the lights were threatening to b at their most useful for Anderson and Broad. England will come again tomorrow, at the earlier start time of 1.30pm because of the overs lost. They will expect to pick up from where they left off.